Your source for daily spiritual inspiration! There’s a family of ducks that just came to live in a pond that I can see from my house. It’s actually a mother duck and her fourteen babies. At first, right after they were born, they all followed her around. They stayed close and moved in a perfect line going wherever she went. If she moved to the right, they all moved to the right. If she sped up, they all sped up. If she hid in the brush, they all hid in the brush. All this was because they knew that they needed to stay close to her to be safe. After just a couple of days, the baby ducks started to grow. As they grew they became more and more adventurous. They wouldn’t stay in line any longer. They all started spreading out and exploring on their own a little. Every day that went by they ventured out a little further. While they did this, the mother duck stayed close to them. In fact, many times, the mother now followed the little ones around rather than them following her. She always kept close to them as they ventured further and further away. Every once in a while something would scare the baby ducks. Maybe it was a frog croaking or jumping or just the breeze moving some leaves near them on the shore. When they did get scared, they would rush back to their mother where they again felt safe. But, they never had to run too far because the mother was always close by. I laughed to myself as I watched because this happened over and over again. The little ducks were very brave for a few minutes at a time. But then it hit me: aren’t we just like those baby ducks? What I mean is, we stray – we go out on our own and try to find our own way – quite possibly getting scared along the way. 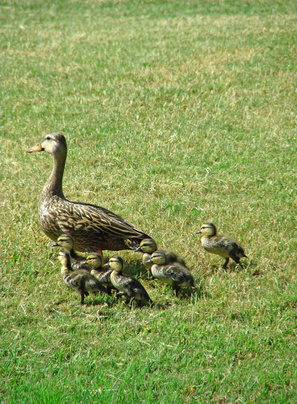 The difference between those baby ducks and us is that someday they leave their mother likely never to see her again. The ducklings will move on and have no one to run to when they are scared. But for us, even if we don’t have a parent around, we will always have God, our heavenly Father, to turn to. Sometimes we move away from God and there might be times we even separate ourselves from Him. But like a good father, He stays close to us while letting us venture out on our own, trying to find our own way. But He always stays near to us in case we get scared or get ourselves in trouble and need to come running back to Him. He waits for us as patiently as that mother duck waited for her ducklings when they needed her. God told Joshua He was with him. However, God is not just with Joshua. God is with all of us all of the time, wherever we go. When we are unsure or get scared, we can rely on His word when He tells us that He will be there with us. Knowing that God is such a good and caring Father should make us want to stay close to Him all of the time and to not stray too far from Him even though He will be there when we come running back to Him. i enjoy what you share from your site, The Whisper of God. it seems be something i need to hear and is helpful to me. Brings tears to my eyes knowing our God is so loving and we can ALWAYS run to him when we need comfort! Thank you for always being so filled with the Spirit. We do all need to know that God is always with each and everyone of us. Praise Him for being so loving and faithful. God bless you for your ministry to FB fans. So True! What a blessing just to know that God is always with us. I thank God for my parents everyday, but to have the assurance to know that he will never leave us is just Incredible!!! Knowing God is always there is what gets me through the day. I love that you do this daily lets us all know what we should be doing every day. Witch is get on are knees and pray. God knows we all need a little faith. I like your under watchful eyes but Ido beleive animals have a god that they pray to too. Just wanted to let you know how very much I enjoy your inspirational statements which you make daily..!!! May God continue to Bless you so you are able to continue with your calling by bringing many closer to Our Heavenly Father!!! Look forward to reading more of your enlightened messages!!! I loved this story, and Thank you for the read, it delighted me very much. this is beautiful very simple but so right to the point love the way you see things! I will be looking forward to the whisper of GOD! Wonderful story, thanks for sharing it! This is something I needed to see today, I know God is always there with us, I just needed to be assured. Thank you! I love all your posts and stories… they are such a blessing keep them coming. What a beautiful story! I will certainly be reading more of what you write as I enjoyed this so much! So beautiful ! You are comforting, inspiring and a true man of God! Beautiful story. The whisper of God always lifts my spirit, very greatful. What an awesome story!! Thank you for sharing this and all the inspiring ones you post on fb everyday….I always look forward to reading this each day. I hope and pray that anyone who wants to find their way back to our heavenly Father will not think twice when he/she reads this story and realizes our loving God will embrace and welcome him/her back at any time. Our God is truly an awesome God!!! Praise the Lord for your ministry!!!! I look forward to read what you post everyday , We need all we can get to help use stay strong in the walk we have with the lord , And your words have been a blessing to me and my family , Please keep up the great work . I was so lifted by that story. I was and have been feeling down the past couple of day. Knowing that the Lord is always there is a great comfort to me, but like those ducklings I tend to wander from him and sometimes forget that the Lord is always there for us. Thank you so much for sharing that story and the insight of it on the spiritual and biblical side. God Bless, looking forward to reading your future posts. That is a most beautiful story-creating very comforting, supportive, and secure feelings. And it is just that right now, just a story because it has not gotten yet from my head to my heart. Thank you for your daily postings, etc. They are very appropriate to my needs. 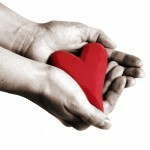 Thank you for a very clear picture of the Love of God that is always there not if but when we need it. I once saw a father and his toddler son walking thru the parking lot. He was holding his son’s hand to get him thru the parking lot safely. As a mother duck watchs over her babies, and a father holds his sons hand so does our God watch over us and holds our hand. Thank you for your daily posts. As a mother, I can relate to the duck story…many feelings rose up as I read it. Gives you a perspective of how God feels when His children do not pay attention to Him, and it’s only because He knows what’s best for us. He hurts when we hurt. Bless you. Thank you for your words they are wonderful, God has belssed you with a wonderful gift thank you for sharing it with me, on facebook I look forward to reading what you say everyday before work and after.Am a widow for 8 aqnd 1/2 years now, God took my husband when I was on 51, I never thought I would make it this long, but with Gods help, I have. He is such a loving and forgiving God. Am so glad he is with me and lets me wrorship him, no matter the trials, I go through he has been right there to see me through, time after time.I don’t know how I will ever repay him for the love and forgiviness he has given me over the years but am going to try. Thanks again for all you do in God’s our father’s name. What a blessing you are! I ENJOY GETTING UP TO YOUR POSTS EVERY MORNING WITH A HOT CUP OF STARBUCKS . I LOVE ALL OF YOUR DAILY POSTS. THANK YOU SO MUCH. Just read this post to my 8 year old grandson, Joshua. He really got it! Thanks for your insightful posts each day! It is wonderful knowing that the Lord is there and will protect us. He is also there to lead us if we are willing to let him. Praise the Lord! He is a just and mighty God! If God is always with us then why does he let the innocents suffer and the wrongdoers get away? Many a times, i have trusted my life into the hands of God and taken steps forward believing that he’s with me. And almost all the time, i had to take backsteps in order to prevent myself from getting hurt further. Very beautiful story and very true. Thanks for sharing. I enjoyed reading the article. Its very beautiful and touching . Elmer, that was just beautiful and brought me to tears too! I will often go to the park to just sit and watch the ducks. Your correct! 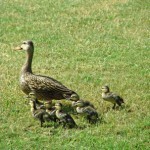 No one could disagree, this mother duck protects her ducklings like our mothes protected us!! My mom is gone now for 20 years, but I always talk to her, and through my beliefs I know she hears me. When I see a cardinal, I think and lots of times say, mom’s here! I can’t think of mom without knowing she’s happy with God. She’s back home and as much as I miss her, I know I’ll see her again. Thank you so much for all you give to us Elmer! God really loves you to instruct us as your doing! He’s here with us, but when we stray, He has you for us, and for this alone, I know I’m blessed! Thank you Elmer!! I just read this entry, and I JUST STARTED CRYING . . . My load feels SO heavy, my Troubles SO Easily fixable, but I feel Abandoned! NOT BY GOD though, but by My own Duckling . . . I have a Grown “duckling”, whom has the Capability available to her, to “Play-it-Forward”. . . yet, I cant seem to get her to Understand, That I REALLY NEED Her Help! I am IMMOBILIZED, “stuck”. . . the steps that I need to take to reach the “Goals” that I need to achieve: my “Health, Job, & going back to School”, just CANNOT happen without some “help” from her & her fiance’. (He has the ability to put me in a VEHICLE) I am Not being “Materialistic”, the Sad Fact is: Without a car, I cannot get to the places I need to get to, in order to Take care of Myself. . . MY VERY HEALTH is in Question here too! Sorry for myself? NO, I am Angry that I have been reduced to this feeling of “Why?” I realize, my Dear Sweet Father God IS ALWAYS THERE, & I know He has His “Plan” for each & everyone of us. . . but honestly, RIGHT NOW, I need a dose of “HUMAN HELP” too. . . HEAVY SIGH< HEAVY HEART, (I am so CLOSE to accomplishing what needs to be done, yet SO far) and as stated: My Very HEALTH is @ stake here!!! Great work you are doing for the Lord, and helping me. Thankls. Dear Elmer, I just finished reading this and thought about the geese that are right now being raised on the pond where I live. It is a beautiful story. My husband and I watch as they grow. They are now taking “flying lessons”. Just as God does with us, he is letting them become independent a little at a time. I wonder if they know that when Momma is gone, God will be there for them. I very touching story, but I did not cry. I rejoiced at the power of the Lord to be there for us….reminds me of Footprints in the Sand. Maybe God is making you take those back steps for a purpose. Not all the bad guys get away. In the Bible, God showed his wrath to men with instant death. Read the book of Solomon. Now there is a story! Do not lose your faith….he is letting you take baby steps…and steps back to rethink where you are going. All of us must suffer in order to truly know joy. God bless you. Love it like usual, I love your down to earth talks, it gets me through many days. Some make me smile and some take my breath away, realizing I have missed the boat a few times. Very grateful that God can use you in this way. To God be the glory! !